In 1957, Ghana became the first black African nation to gain independence from European rule. As a British colony, the country was known as the Gold Coast, an unambiguous reference to its most valuable resource. In fact, even before the arrival of the Europeans in the 15th century, Arab and Jewish traders crossed the Sahara from the north to buy gold in exchange for cloth, salt and spices. Today, gold is Ghana's most valuable export in 2005, us $1.4 billion worth of gold were shipped from the country, dwarfing the value of its other major foreign currency earnerss, timber and cocoa. Ghana contributes 12 per cent of the world's gold production. However, very little of revenues stay in the country.The reasons are typical despite almost 50 years of political independence, Ghana, like most African nations, remains largely dependent on foreign investment, having undergone extensive liberalisation in the 1990s under the diktat of the World Bank and International Monetary Fund (imf). This means that companies supplying foreign capital, technology and management in the mining sector have replaced state enterprises in exchange for large concessions and a token royalty of 3 per cent of profits. Two distinct groups of gold miners have emerged over the past decade or so foreign companies conducting large-scale operations; and local small-scale miners, the majority of whom operate illegally on concessions awarded to foreign companies. The number of illegal miners, or galamsey, as they are known locally, has boomed of late as the price of gold has risen, mirroring a loss of confidence in the us dollar. To understand how these two groups of miners relate, I visited some of Ghana's important mining areas. A string of chaotic and tumbledown towns dotting Ghana's gold belts provide little evidence of the hundreds of millions of dollars worth of gold extracted, processed and flown out from the surrounding lands every year. I first visit an illegal mine at Noyem, near the town of Nkawkaw, 180 km north of Accra, the capital, in the country's eastern region. The land is part of a concession owned by the us -based Newmont Mining Corporation. It contains rich fracture zones from the main gold vein, which over the last few years have attracted thousands of galamsey miners. Before heading off to explore the site we talk with the local chief. We then spend the afternoon on site talking with some of the estimated 25,000 individuals who work in shifts round the clock to dig, crush, sift and separate the gold deposits, which first appear as specks in buckets. As in most countries, in Ghana, the law states that while land may be privately owned, all the minerals under the ground belong to the state. In many African countries where traditional tribal structures and relations have managed the land for generations, this automatic transfer of ownership and rights to a distant government causes a number of problems and potential conflicts.As a prerequisite for the kind of market-based reforms promoted by the World Bank, this legal institution enables the government to sell tracts of mineral-rich lands to private mining companies who produce 88 per cent of the country's gold. Given labour and capital costs in Ghana, mining companies spend roughly us $200 to extract an ounce of gold. Since the price of gold has increased to well over us $600 in recent months, this is clearly very profitable. The Noyem site contains plenty of 'free' gold, not attached to any other mineral. Here, the galamsey are mainly engaged in 'dig and wash' the gold-rich surface deposits are dug up, crushed if necessary, and washed down a wooden chute, or sluice box, covered in towels and carpets which capture the heavier deposits. These are then rinsed every hour or so into a bucket, the contents skilfully sifted and separated until a small amount of material is left. At this stage the gold particles are clearly visible. The final task of consolidating the gold can be achieved in a number of ways, though the most common approach used is to add mercury -- as effective as it is toxic. Once all gold particles have been consumed by the liquid metal, the amalgam is normally cooked to burn off the mercury, leaving behind the concentrated gold. Apart from the practice of panning gold directly from rivers and streams, this is the most basic technique available. Its low cost also means low efficiency. Experts estimate, it captures only 30-40 per cent of the gold. Since the Noyem site is relatively new, there is no history of conflict with either the authorities or the concessionaires. Furthermore, the local chief and his advisors are negotiating to secure their own mini-concessions to replace the 'live and let live' policy of turning a blind eye to the thousands of galamsey miners. If this were to come about, it would be the first of its kind. The chief envisages a number of benefits currently, the galamsey often find themselves in a vicious circle of under-funding driven by unscrupulous buyers who buy small amounts of gold for as little as 50 per cent of the market price, often when miners have little choice but to deal with buyers who provide credit to pay workers. Credit arrangement are subject to contacts and preferential treatment, causing conflict within g alamsey communities. The wages earned by galamsey miners in Ghana are typically double the average for unskilled labour where workers can expect to earn us $ 3.50 a day. If these miners were to be 'legalised', it would allow them access to microfinance to replace a situation where miners find themselves hostage to buyers. Feliz Dakurah Kojo, manager in charge of health and safety at Noyem, told me "Once we have legal status we will be able and willing to look after the land better. The workers would have more respect for the environment...With ownership comes responsibility, and since they would be subject to official inspections, the miners would take care of the land because they know that they could lose their job otherwise". Behind the rhetoric, of course, the potential benefits to local bosses are primarily financial, and they stand to make a lot of money out of legalisation. Their arguments echo pre-independence discourses of leaders who told the people that once they became free, everything would be okay, everyone would be rich. Unfortunately, reality was more complex. But there are roadblocks. Nick Cotts, the head of environmental and social sustainability for Newmont's African operations, questions the desirability of moves to legalise the galamsey. "If this were to go ahead, we would have to be careful not to be too closely associated with efforts to regularise these miners...it must be seen to be a government-led initiative, otherwise it could set a precedent and lead local communities to come knocking at our door for more concessions." This is a cautious though unsurprising position and puts the ball in the government's court to take action on an issue which is recognised by most parties as a potential security threat, if galamsey miners were to move further into private concessions, or indeed if they were to organise a take-over of sites where the companies are active. Until something like that happens, the government appears to be satisfied with the current live-and-let-live approach, and is unlikely to make a move unless Newmont pressures them. This complacency reveals how short-term rents take precedence over longer-term planning. One of the first things that struck me was the presence of women and children who live and work at galamsey sites. I spoke to some of the women. Christiana is from the Ashanti region, close to Noyem. 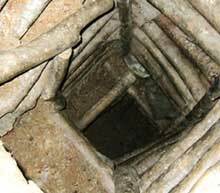 She transports ore from the many underground shafts which dot the landscape, carved out of the tropical forest and citrus plantations. It's hard work. "I came here because my brothers got work at this mine and said it was good. I get paid 2,000 cedis (20 cents) for each bag I carry, so I make quite a lot in one day, much more than in the past. I think there are many women here because they can make more money this way, and mostly our husbands work in the mine too." The high wages also attracts outsiders. On many galamsey sites it's not uncommon to come across workers from neighbouring Burkina Faso, Ivory Coast, Mali, Niger, Nigeria and Togo, though the majority are Ghanaian. On the whole, the galamsey operations are a model of diversity and tolerance -- Ghana's Muslims and Christians work in peace alongside each other. 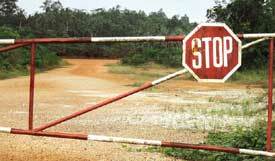 Conflicts among the galamsey are said to be rare. Doris, 22, came to Ghana with her family from Nigeria three years ago. "Ghana is a peaceful place, you know, and we have plenty of work here. I think this is the best we can ask for," she says. One of the world's experts on small-scale gold mining in Ghana is Gavin Hilson, research lecturer at the department for environment and development at the University of Manchester, uk. "The most important thing to remember with small-scale mining in Ghana is that it is a poverty-driven industry," says Hilson. When I ask him about the attitude of foreign operators towards the galamseys, he says, "Unfortunately, the problem with this relationship is that it boils down to a simple clash of economic interests...in most cases galamsey miners are operating on concessions awarded to the foreign companies, making them illegal. As the gold diminishes and these two groups meet, conflicts are not inconceivable." I was able to see this potential problem for myself at the extensive Prestea site in the western region, a well-known conflict zone and part of the Prestea-Bogoso concession controlled by Bogoso Gold Limited (bgl), 90 per cent owned by Golden Star Resources, a Canadian-listed operation. Prestea is a sprawling settlement built around small-scale mining, which dominates the local economy. Mine sites are alive with thousands working round the clock. Conditions are poor miners live either on or close to the sites which are crowded and strewn with litter and pools of stagnant water. The more established areas made up of permanent buildings are surrounded on all sides by ramshackle huts, stalls and impromptu camps. We visit the town after dark. There is hustle and bustle, music, trade. Food is cooked on the street and akpeteshe, a strong, cheap spirit distilled from palm oil, is drunk. Down the road is bgl's huge Bogoso mine. In July 2005, the galamsey at Prestea and surrounding villages protested at the Bogoso concession about the conditions and specifically about mine blastings, which were occurring unannounced, distressing residents and damaging houses. Seven people were shot by bgl security for encroaching on the concession. The company has a bad track record on environmental damage. In October 2004, a cyanide leak from the site rendered water undrinkable for weeks; and again in mid-2006, a cyanide spill affected nearby Dumase, whose inhabitants reported illnesses caused by contaminated water. Emmanuel Quarm, 24, is the chairman of the 'Number Four Bungalow', a galamsey camp named after one of the four mining bases built at Prestea by the British in the 1920s. "I blame the government for giving away such large concessions to these private companies. It is their fault that we are made to be illegal people living on our own land," he told me. There is no surface mining at this site at 'Number Four' -- the galamsey instead extract gold from material carried up through rickety vertical shafts as deep as 400 feet. The miners operate in gangs of 10-20, each assuming a different role. When I asked Quarm how often accidents occur, he skirted the subject, saying accidents are rare, though diseases, especially tuberculosis (from mining below the ground), are prevalent. hiv/aids is also a serious problem. Quarm is critical of the dig-and-wash methods used by some galamsey at Prestea. He argues that it's more environmentally harmful as the gold-rich layers of top soil are cut out and washed away, rendering useless what was once farmland, leaving behind swamps, breeding grounds for malaria. The next day, we return to Prestea, this time to the 'I Trust My Legs', or 'I Trust', site, another camp based around Prestea town, so called after the miners who were once chased off the site by security guards. Here, it is evident that the hunt for gold breeds greed and sometimes corruption not only amongst the corporations and the government, but amongst tribals. At the I Trust site, it is well known that one of the deputy chiefs sold part of the land used as the local cemetery of the Nakaba people to a group of the galamsey for 2 million cedis (us $220), plus weekly payments linked to output. We also found children, some as young as seven, labouring on the site. I spoke with Kobi Nyame, 13, who was washing black sludge in the refining huts. Kobi attends school, though not before eight hours of work. He earns about 100,000 cedis a day (us $10), much more than the average unskilled wage. "I give most of my money to my mother though I buy some clothes for myself...when I am older I would like to go to university in Kumasi and become a doctor." Perhaps Kobi's job as a galamsey will help him realise his dream, or, like many others, he'll be trapped, unable to leave the security of small-scale mining. To offset the growing dependence upon galamsey activity, bgl has funded a small sustainable livelihoods demonstration farm in Prestea, which has been transferred to local hands. The project contains three elements silkworm cultivation, poultry, and tilapia (a freshwater fish) farming. Sam Quansah, the man in charge, explained to me that the silkworm eggs and worm production technology has been imported from Korea and India and is successful. "We rear the worms here, feeding them mulberry leaves which we grow on site. We are selling the dried cocoons to factories in Accra for us $5 a kilo where some processing takes place," he adds. Such 'livelihood' projects are being promoted by big development institutions such as the uk's Department for International Development in partnership with the private sector. From the companies' point of view, these projects are an effective and low-cost way to demonstrate corporate social responsibility. 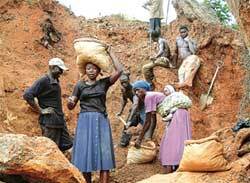 However, it will be difficult to lure people away from higher paid work of illegal mining. Until this is recognised, galamsey communities are likely to grow. Our next stop is Dunkwa, a town in the central region, on the border of Ashanti territory along the Offin river. Almost all the gold deposits here are included in the Dunkwa Continental concession owned by another Canadian-listed company, Continental Construction Ltd. We first visit the offices of the Regional Minerals Commission to discuss issues facing local mines and miners. Mike Appiah-Arthur is the district officer in charge of small-scale mining, whose job is to coordinate the regulation of small-scale mining. He clarifies the nature of small-scale mining, which operates both legally and illegally, though the majority is illegal. "For example, within this monitoring area, eight sites have been legalised and issued with small-scale concessions, involving approximately 1,000 miners," Appiah-Arthur says. I enquire about the approach to galamsey communities "We do not encourage them, but we recognise the role they play and are involved in education programmes, especially in the way mercury is used," he says. The Dunkwa Continental concession was bought in the early 1990s. The operation mined gold for a few years until the global market price collapsed to less than us $250 per ounce in 1999. Since then, a significant galamsey population has grown on the concession. The company hasn't resumed mining and the government is planning to revoke the licence, frustrated, with the local chiefs, that they have not been getting royalties. We spoke to Dunkwa Continental's site managers about why they hadn't developed their concession, and what they thought about the expanding galamsey community. Chris Adu, a manager, said, "The galamsey are illegal and we have nothing to do with them. We would like them to leave." He also informed us that the company is discussing strategy to address the issue of illegal miners working in the same areas they want to develop. "We do not wish to have any conflict so we are thinking about ways of involving these miners. We do not know what form a future relationship will take, but one option is to allow them to mine on the condition that we buy their gold," he says. This option would appear to be favoured over the creation of a sub-concession. "We are sympathetic to the galamsey. But we also have our interests to look after." 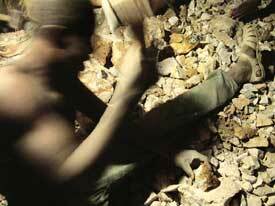 On average, 10-12 per cent of Ghana's gold production comes from the galamsey miners. This is known because gold buyers are licensed to maximise the state's revenues and minimise smuggling. This gold is sold to the state-owned Precious Minerals Marketing Corporation, presenting an interesting contradiction between the government's willingness to accept galamsey gold while doing little or nothing to support or otherwise formalise their industry to help iron out injustices and ameliorate health and environmental risks. To see the reality of galamsey mining at the Dunkwa concession, we visited the Asontabo mining group, managed by Kofi Abrefa, employing about 350 people. Until 2000, Abrefa had his own licence, but the government did not renew it after the private concessions were awarded. Now he operates illegally. Abrefa explained to me how, after they first arrived on the site, they went to speak with Dunkwa Continental about operating on their land, but were refused time. As is the case with most sites, there is no dialogue between the galamsey operating at Dunkwa, the concessionaire and the government. Establishing dialogue between communities and the formal sector has been a function of several ngos. One organisation I spoke to investigates cases of conflict or injustice suffered by communities due to mining, and offers advice on how to deal with the authorities. I spoke to one of their staff, whose job is visiting affected communities, understanding their problems and reporting to the ngo committee. "The main problems are related to displacement, mainly by the big mining companies. This experience creates unemployment and often pulls families apart," he said. I asked him what he thought the authorities were doing, or failing to do, about these problems. More than anything, he blamed the government's mining laws and policies, which, he argued, failed to consider the local people "We are not calling for a ban on large-scale mining. No...we are demanding that the government involve the local people to help make it a more democratic and responsible industry." He was critical of the Minerals and Minerals Act (2006), which, he suggested, failed to address community issues and protected the concessionaires. In Ghana, which depends heavily upon its natural resources, the current mining laws seem a brutal, unjust and ineffective way of development. Given the huge mineral wealth being extracted from Ghana, and how little of its value stays in the country, one wonders whether future conflicts of the type that have occurred in Nigeria with the oil industry are likely. Slow progress is being made in pushing for tighter control over mining companies. For example, the Extractive Industries Review (2001-2003), launched by the World Bank, was praised, though forward movement is frustratingly slow. Progress, however, may prove to be little more than a change in style when it comes to protecting private assets. Evictions by stealth and bribery may replace fences and guns, though the economic winners are clear to see.